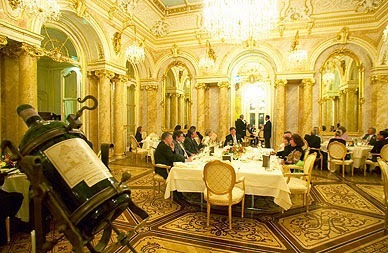 Palais Coburg Residez in Vienna in the Old World has the best wine list in the world. New York City in the New World has the most top wine lists in the world (36). London is second (16), San Francisco third, Chicago fourth, Sidneyfifth und Melbourne sixth. Over 4,000 restaurants from around the globe were judged by the UK-based publication The World of Fine Wine (WFW). The judges awarded 750 restaurants a one-, two-, or three-star award. 225 wine lists made it into the top three-star category. The judges also identified, region by region and for the world as a whole, the most exciting lists in 5 categories: Best Overall Wine List, Best Champagne & Sparkling Wine List, Best Dessert & Fortified Wine List, Best By-the-Glass Wine List, and Best Short Wine List. Finally, the judges recognized with a special Jury Prize several lists that showed distinctive character and flair or were particularly strong in a specific wine style. The top award went to Vienna hotel Palais Coburg Residenz. Falstaff: Es sind sechs einzelne Keller in den unterirdischen Gewölben des Wiener Palais, in dem insgesamt 60.000 Weine lagern. Alleine im Frankreich-Keller schlummern 30.000 Flaschen in allen verfügbaren Formaten. Big Brands wie Petrus, Mouton, Latour oder Lafite sind aus allen großen Jahrgängen vertreten. Alleine die Yquem-Sammlung umfasst von 1893 bis heute aus jedem Jahrgang zumindest eine Flasche. Auch der älteste »noch trinkbare« Wein der Welt (laut Michael Broadbent) lagert im Palais Coburg: Der Rüdesheimer Apostelwein aus dem Bremer Ratskeller stammt aus dem Jahr 1727. Regional winners: The Austrian venue also took the regional prize for Best Wine List in Europe. Here is the complete list. For the complete list of 750 restaurants rated at least 1 star, see here. I live in New York and I have been to most of these restaurants. Bar Boulud and Restaurant Daniel is my personal favorite. Restaurant Daniel has been listed as the best hotel bar nyc.